Señorita Rio is an agent with American Intelligence. Numerous times throughout the series it is stated that she worked for U.S. Intelligence but as many times it said she was a part of the Secret Service. This term, though, was not used as one might talk about the former Treasury bureau lending credence to the idea that she was not a Secret Service agent but rather an agent with America's secret services. This is, still, just conjecture but since the duties of the true Secret Service is either Presidential protection (and related dignitaries) and protecting the Economy, my percentage is high. Before Ms. Rio became a name spoken of with awe in the cloak and dagger world, the lady went by the screen name of Rita Farrar. It is not known if that was her real name or just a stage-name but it is as that she was known throughout the movie viewing world for several years when she was described as a Hollywood starlet, the toast of Hollywood and later also of Broadway. She was likely to become even more famous with the release of her latest film, "Lady Dance No More". Her personal life was as stellar as her professional one as she was deeply in love and engaged to be married to a Naval officer we only know of as Bill. Then came the attack in 1941 on Pearl Harbor and with it the death of her beloved Bill and a deep growing hatred for all things Axis-related. She searched for some way to fight back and the solution came with an offer by a leader in the Intelligence field - she could come work for him and use her knowledge of Spanish and her Hispanic complexion to head south of the border and fight the numerous incursions by the fascists to either take control of the many nations there or to cause enough trouble for the U.S. as to make their war efforts that much harder. As she described shortly after she started her work, "my life is now revenge" and she would prove that many, many times over the next few years. Coupling her incredible good looks and sultry beauty with an extremely athletic body, she would become a tremendous weapon against the Nazis and their friends. 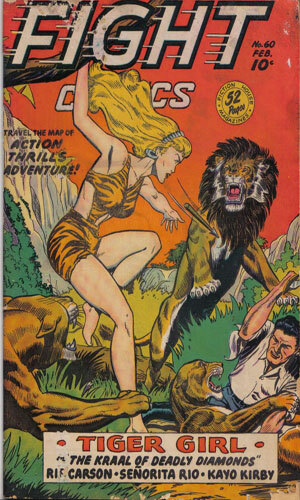 Add to that her impressive ability to control her fears and forage into the mouths of danger over and over and she would gain a reputation throughout both continents. Over the next three years Señorita Rio would continue her fight against the Nazis and their confederates in Central and South America. When the War was finally over, though, it was clear that the troubles in the area would change but still continue and America would still need for some years to come an able-bodied representative to keep up the fight and Rio was it. Note: in several place early in the series, the back-story to who and why of Señorita Rio is told. For some unknown reason, late in the series in the 47th tale, The Affair of the Liquid Gold, a bad guy is shown reading a dossier on Señorita Rio which has her full name as Consuela Maria Ascencion De Las Vegas, a former star of the Brazilian stage, who left show biz when her husband, Luis De Las Vegas, was jailed by local fascists. Nowhere in the story does that revised bio play a part and it is not mentioned in the few subsequent stories. It is likely the bad guy was handed incorrect data. 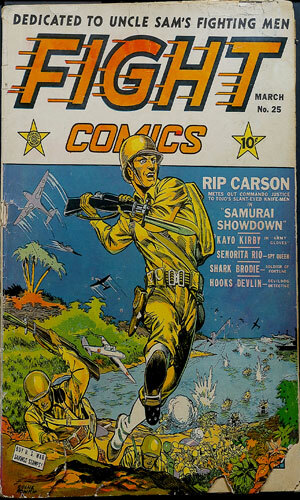 One of the many comic book publishers that came into existence during the late 1930s was Fiction House. 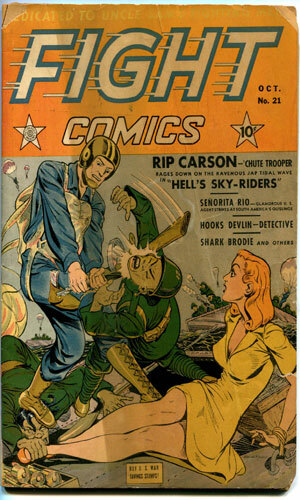 It had been around for quite a few years already as a pulp fiction publisher dealing largely in stories about aviation, the Old West, and sports of one sort or another. After nearly a decade of these genres, it branched into other fields most notably detective adventures. 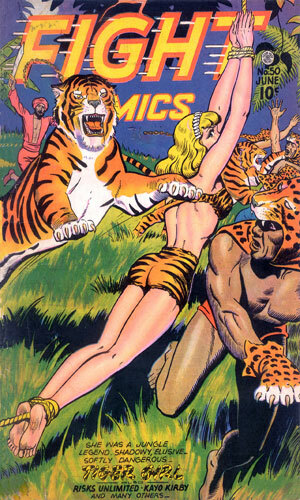 When comics showed promise, the company tried as well. 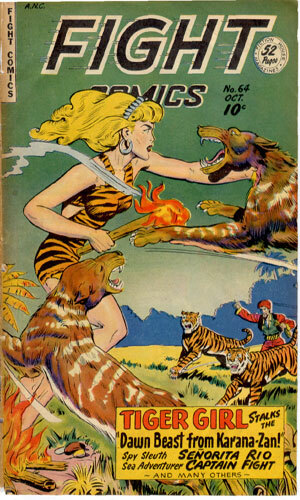 Its biggest early success was Sheena, Queen of the Jungle but that was not the only success. 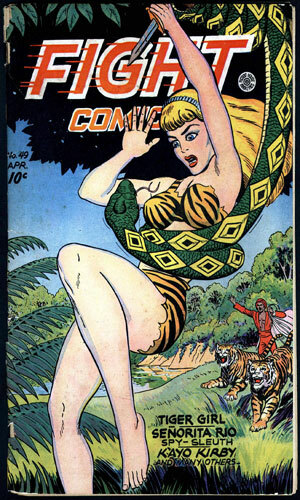 Another magazine that came several years after Sheena's Jumbo Comics was Fight Comics and one of that publications many different denizens was Señorita Rio. The first dozen and a half issues had a wide assortment of storylines and characters all apparently striving for recognition but none truly gaining supremacy. 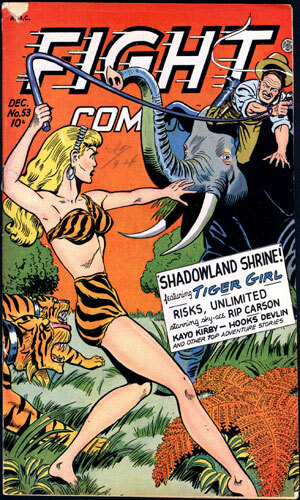 Shark Brodie, Kinks Mason, Kayo Kirby, Oran of the Jungle and many others each had a tale or two. The artwork for the first issues was simplistic to be the most kind and the stories were largely of the "hey, I'm here. I might as well hit someone." variety. It would not take many issues, though, before the quality of the art rose tremendously and that of the stories improved as well (still a lot of punching when all else failed, of course). As the different genres tried to be noticed, the spy fiction was not absent but it was coupled with science fiction to give a futuristic Saber, the Spy Fighter. Actual contemporary spy stories would not come until Ms. Rio showed up. 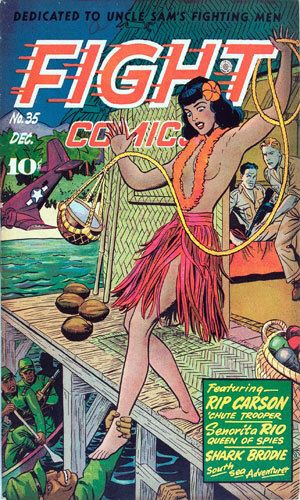 The first adventure of the lovely actress-turned-agent arrived on the newsstands in June of 1942 inside the pages of issue #19. The "creator" was said to be a Joe Hawkins for the first story but from the second until the last the byline was that of Morgan Hawkins. 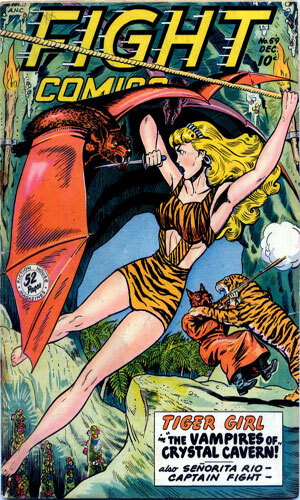 This was a house name as no such Hawkins existed and the actual writer and artist for the series would change over the eight years that Señorita Rio would wear her cloak and carry her dagger. 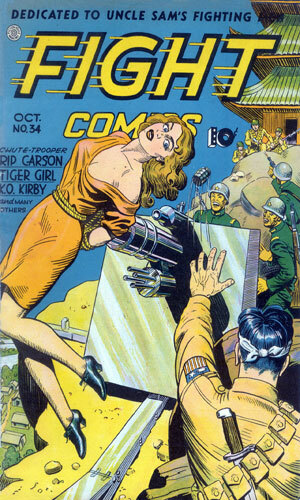 The true creation would be credited by many authorities to Nick Viscardi, later known better as Nick Cardy, truly a legend in the industry by the time he laid down his artist pen. He stayed with the series for a few adventures before heading elsewhere and letting others continue the tales. 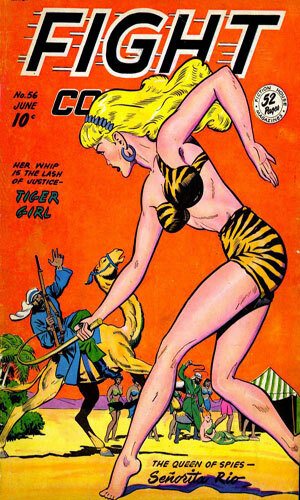 One artist stayed with the job longer than any other and that was Lily Renée, one of the greatest female comic artists in the history of the business. According to Wikipedia, Ms. Renée's work on Ms. Rio would take place in Fight Comics #34-44 and 47-51 (stories #16-26 and 29-33 in my numbering below). Who the other writer/artists were is not yet known by me. For a pretty fascinating story of its own, check out the many Internet references to Lily Renée. In 1985, Paragon Publishing, aka AC Comics came out with a new series of scantily-clad, big-breasted women out to fight for justice. Fem Force was the name of the group, short for Federal Emergency Missions Force. The members of this group were either actual characters from defunct companies of the 40s or interpretations of such heroines. Miss Victory, She Cat, the Blue Bulleteer and others flew whenever and wherever trouble was happening and did what it took to save the day. Apparently one of its original members "back then" was, according to AC's storyline, Rio Rita, a woman who gave up her movie career to help fight the fascists. She would later move to Brazil, from what I can discern, and became head of that country's intelligence force. She would remain in contact with the revitalized modern Fem Force and, in that comics' first issue, ask for help to save a valuable scientist who was being guarded by her own granddaughter, Rita Farrar. This younger Rita would work occasionally with Fem Force as time went along. From Fight Comics #19 - Rita Farrar fakes her suicide and goes after a German countess who is trying to get some forged papers to the Brazilian Minister of State. The newly dubbed Señorita Rio is determined to stop her. 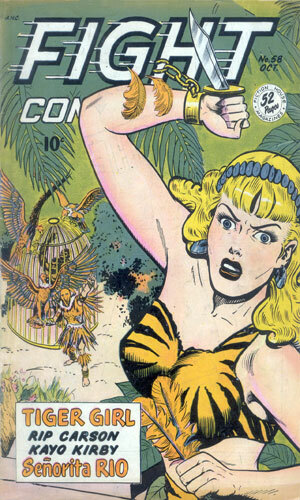 From Fight Comics #20 - Señorita Rio "battles Argentina's Condor Legion, those vicious black-shirted puppets of the Axis". From Fight Comics #21 - In an unspecified South American capital, Señorita Rio demands to see the President with a warning that a coup hosted by the Nazis is about to happen. She is too late to stop it but not too late to help defeat it. 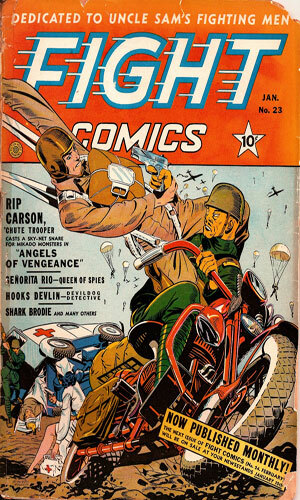 From Fight Comics #22 - Trouble is brewing in German-populated southern Chile where a plot is underway to start a war with neighboring Argentina. Señorita Rio is ordered to break up the group. 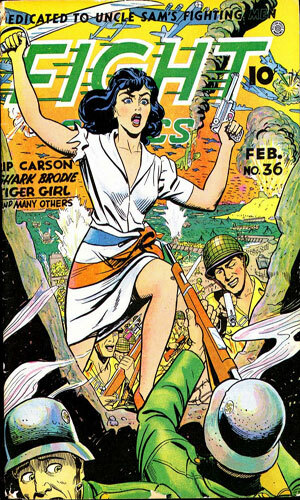 From Fight Comics #23 - The President of an unnamed South American nation asks the US for the help of Señorita Rio to stop the rebels led by an enigmatic "white god". 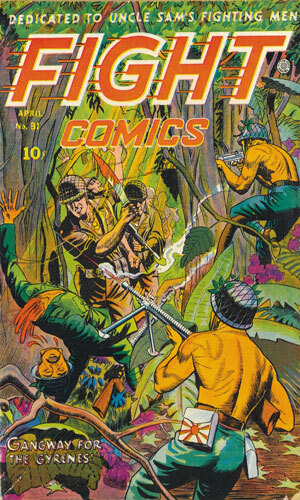 From Fight Comics #24 - A Chicagoan gangster is operating a secret Nazi base in the jungles of South America where a plan to destroy the Panama Canal is being prepared. It is the job of Señorita Rita and another agent to stop it. 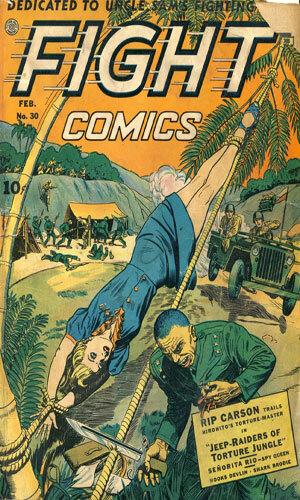 From Fight Comics #25 - Shipments of much needed rubber from up the Amazon are not reaching their intended destinations but are being diverted to the Axis powers. Señorita Rio is ordered to correct that. 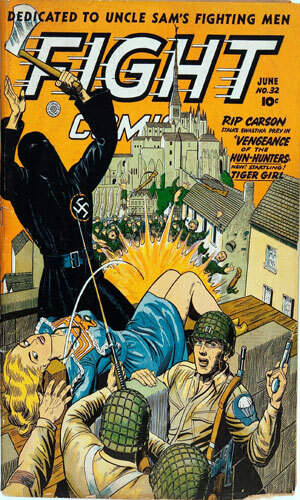 From Fight Comics #26 - A Nazi spymaster has a plan to explode bombs in floats during the grand parade just as it nears a dignitary platform. Señorita Rio has an uninvited but much needed helper stopping the gang. From Fight Comics #27 - In Chile, Axis agents are poisoning the fields causing the growers to lose money and be willing to sell their land cheaply. 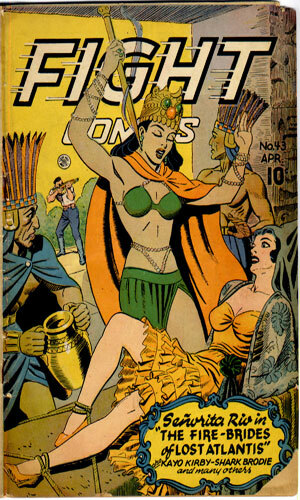 Señorita Rio is sent to stop them. From Fight Comics #28 - An Argentinian diplomat is headed to the US on a secret mission and Señorita Rio is assigned covert bodyguard duty. Good thing because events turn very nasty. From Fight Comics #29 - To figure out how the water supply in Peru is being poisoned, Señorita Rio goes undercover as a German spy currently held in Argentina, not knowing that agent's death was in the latest newspaper. From Fight Comics #30 - Señorita Rio is in the capital of Haiti where her assignment is find out who is using voodoo to stir up the citizens to foment revolution. From Fight Comics #31 - A prominent citizen in Argentina is the target of Axis agents because of his anti-fascist stance. They use a hypnotist act to stage an assassination attempt but Señorita Rio is assigned to stop them. 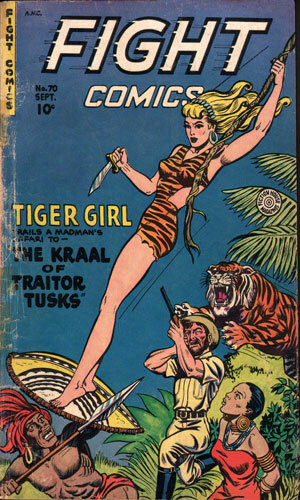 From Fight Comics #32 - On an island in the Amazon delta, the number of Germans have increased and American Intelligence wants Señorita Rio to see if they are Nazi operatives. She heads there posing as an artist. 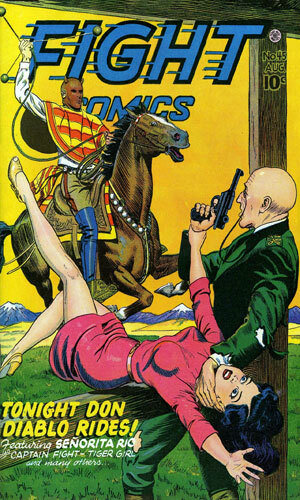 From Fight Comics #33 - A general in the mountains of Argentina commands a group which has considerable pro-axis members and the government wants Señorita Rio stop a revolution before it begins. 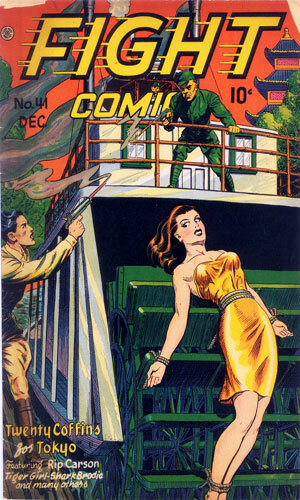 From Fight Comics #34 - Allied ships are being sunk near the Panama Canal and Señorita Rio is sent to one area to see if she can find out the source. 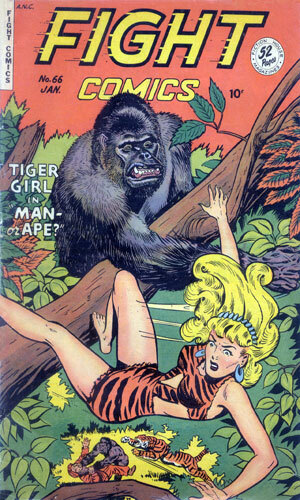 She finds an ape-man who wants to marry her and a U-boat base. 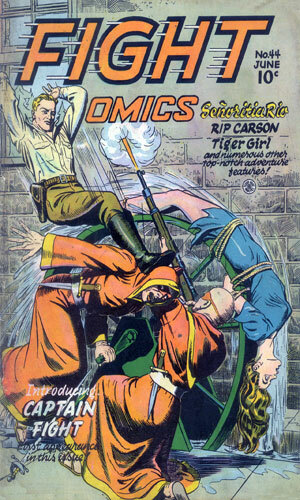 From Fight Comics #35 - The wealthy heiress in Uruguay has been kidnapped by the leader of the Falange of Spanish fascists loyal to Hitler. The plan is to force marriage and then use the riches to back a coup. Señorita Rio is ordered to stop it. From Fight Comics #36 - Would-be monarchists are using the scion of an old noble family in Brazil to be the figurehead in a coup to return a king to power even though the young man is not a willing participant. Señorita Rio is assigned to stop it. 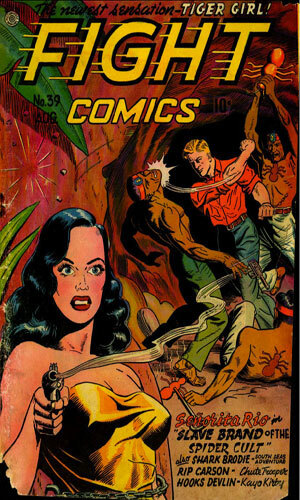 From Fight Comics #37 - Señorita Rio reveals to Hollywood she is not dead after all but before she can have much of a homecoming, she is pulled away for a mission in Mexico to investigate an Austrian hermit and former scientist said to have papers concerning atomic experiments. 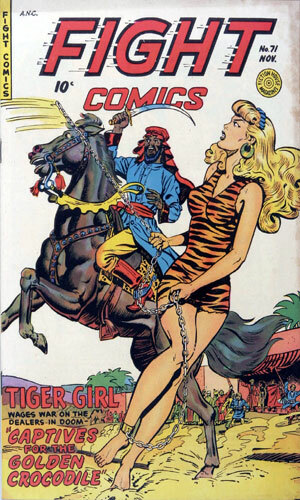 From Fight Comics #38 - On a ship heading to Brazil to shoot a 'good-will' picture, Señorita Rio is really on a mission to uncover a coup plot but the schemers are out to see she never arrives in port. 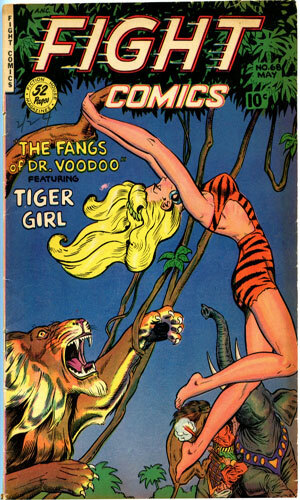 From Fight Comics #39 - The murder at an antique shop near the Panama Canal gets the attention of Señorita Rio and she tells her boss she must learn more. Good thing, too, because it is part of a plot by Nazis to blow up the Canal. From Fight Comics #40 - In Caracas, a wealthy man whose wife is deeply involved in the falange movement to overthrow the democratic government wants to change his will, leaving his wife out. She would rather see him dead first. 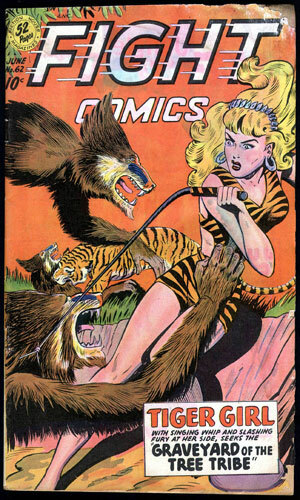 From Fight Comics #41 - Hearing of the "werewolf" organization and its plans to bring on the Fourth Reich, Señorita Rio is to receive a list of member names but evil Baron Schlick, its leader, has other ideas. 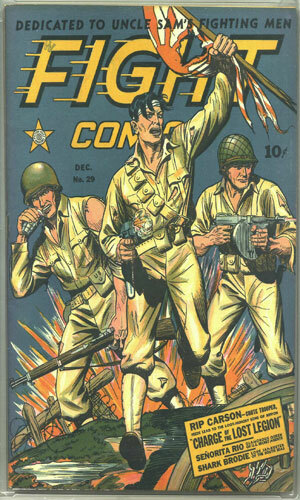 From Fight Comics #42 - A falange group operating in an unspecified South American country is killing Americans at random to destroy relations between the two countries. 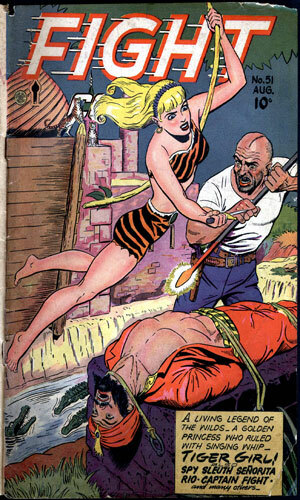 Señorita Rio is sent to help stop them. 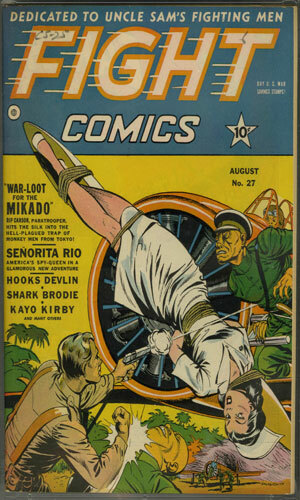 From Fight Comics #43 - Señorita Rio is near the docks of a port when she learns that a famous painter is arriving. As the ship arrives, a man completely wrapped in bandages is removed and the painter tells of an accident onboard. Clues point to a much more sinister enterprise. 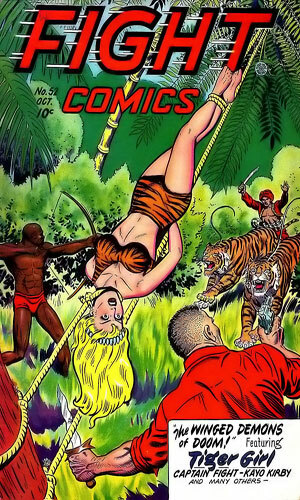 From Fight Comics #44 - Señorita Rio is in Panama on a mission regarding illegal diamond smuggling but before she can get all the facts of the case her briefer is killed stopping a bullet meant for her. From Fight Comics #46 - The southern portion of an unnamed South American country is the hotspot for a separatist leader's action. He has killed two high level government officials and threatens more. Señorita Rio volunteers to look into things and she goes there as a gypsy. 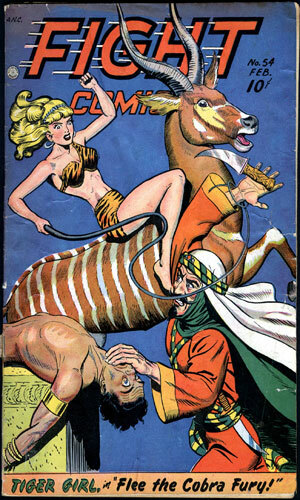 From Fight Comics #47 - Swindlers are out to con a wealthy woman out of millions by using a fake Hitler. Señorita Rio is sent to help the South American country's officials but the bad guys fake her death, pin it on her associate, and kidnap Rio. Bad move on their part. 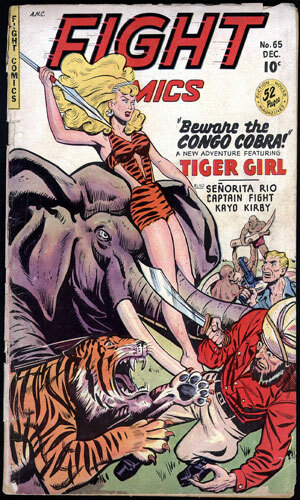 From Fight Comics #48 - Señorita Rio is asked to head to the jungle of South America to assist in tracking down a woman missing for over a year - a woman who might be now heading a tribe as their goddess. Meanwhile, some very nasty people want Rio to fail. 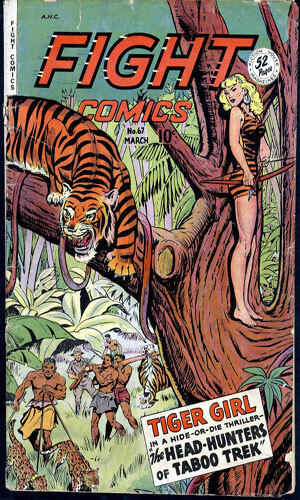 From Fight Comics #49 - Señorita Rio is asked to head into the South American jungle to see if a noted scientist was fomenting rebellion among the natives. He is doing a whole lot naughtier things. 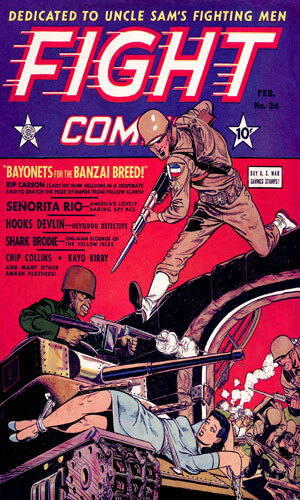 From Fight Comics #50 - The American consulate in the South American country of El Greco have asked Señorita Rio to come help fight the group of former Nazis who are out to rig the election their way. 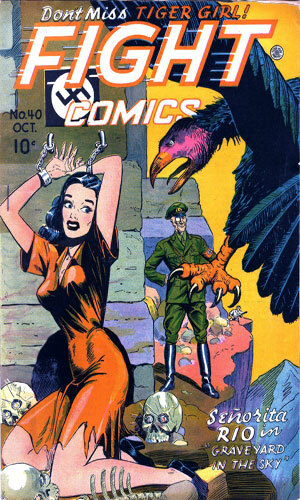 From Fight Comics #51 - For some reason, Señorita Rio is ordered to kidnap the widow of a dead dictator as she is being transferred to a prison in that country. 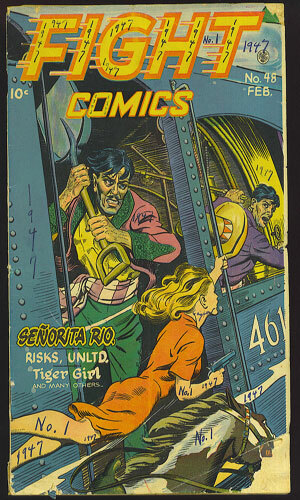 From Fight Comics #52 - A former dictator is about to be hanged but when a plot to rescue him literally falls into Señorita Rio's lap, she decides to see the execution goes through. From Fight Comics #53 - It is fiesta time in Santo Bellos but there will not be much celebrating for workers on Project Espanitar who have gone missing. 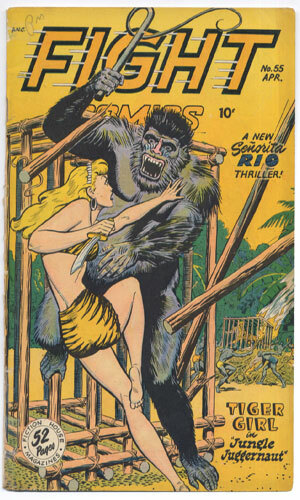 Señorita Rio is sent to the region to find them. She shows one baddie that a cigarette in the eye hurts. 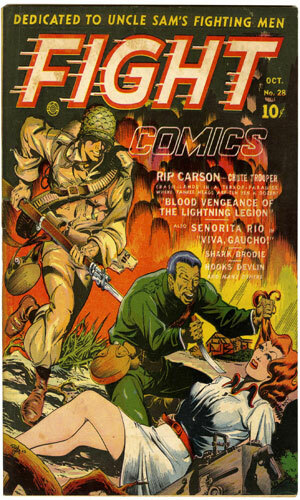 From Fight Comics #54 - Señorita Rio is sent to Santos Madre to assume the role of a nature specimen collector as she seeks word on a man who is trying to take the place of a dead rebel leader. From Fight Comics #55 - The President-elect of Tierra Del Libre disappeared on way to take office, his plane vanishing. Señorita Rio is ordered to head to the last known location and begin the hunt. 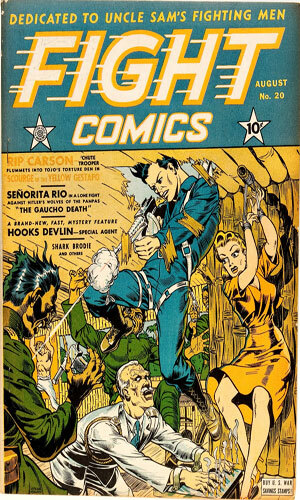 From Fight Comics #56 - In trying to solve one man's murder, Señorita Rio becomes the prime suspect in another homicide and it is all because of someone called the Condor out for the formula to an incredible drug. From Fight Comics #57 - Señorita Rio is told to meet a fellow agent in a nearby city but when he shows up he is run over before they can talk. 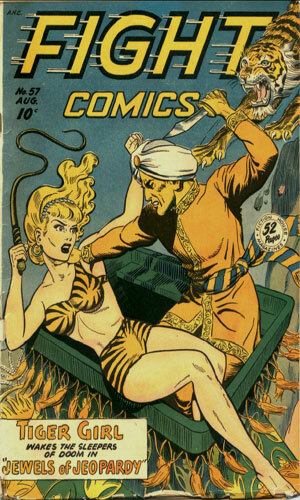 All he can do is toss her a shrunken head, an disgusting object others are willing to kill for. From Fight Comics #58 - The mad scientist who wants to take over a small country has a gas which turns normal people into insane killers. From Fight Comics #59 - When not held captive wearing a mask, Doctor Sebastian is a good scientist who has perfected a very dangerous strain of bacteria that others want. 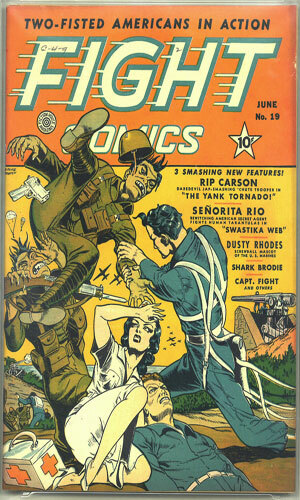 From Fight Comics #60 - Rumors from an upcountry factory says the work force are kept as slaves. Señorita Rio is asked by that country's government to investigate but the owner would rather she died. 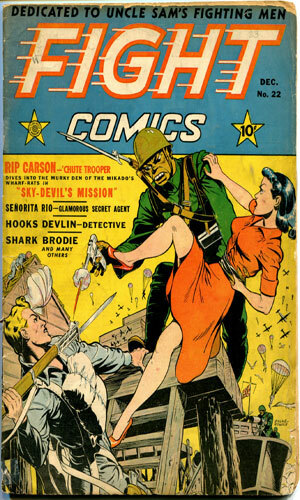 From Fight Comics #61 - On a press tour to Tierra Del Fianza, Señorita Rio is really investigating counterfeiting aboard a U-Boat and its Nazi captain hiding in the area. Fighting an alligator is involved. From Fight Comics #62 - In a Central American country a former rebel leader known as El Bandido, thought dead a few years before, is back causing trouble. Señorita Rio heads there to check it out. 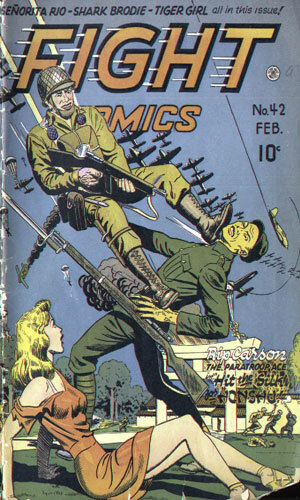 From Fight Comics #64 - In the capital city of a South American country, its President is showing the latest television technology even as its rebels plan to take over the transmission to spread panic. 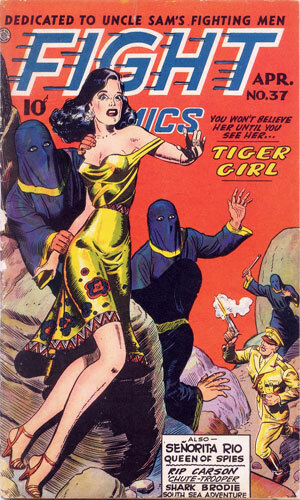 From Fight Comics #65 - Señorita Rio is the target of several murder attempts which sends her undercover to find out who is after her. She learns a rich crook is forcing oil men to sell their derricks at a ridiculous price. Contains an odd rewrite to how and why Señorita Rio got into the spy business. 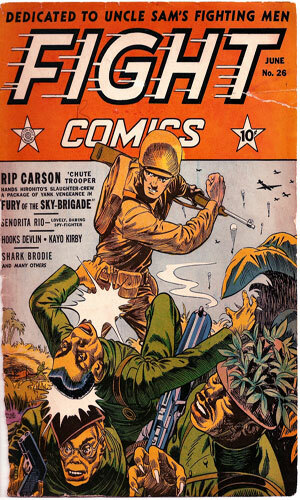 From Fight Comics #66 - Baron Eric Mendez is building a fascist empire in the Amazon and using slave labor to do so. He plans to eventually take over all of South America. Señorita Rio is on his trail. From Fight Comics #67 - Would-be modern day conquerors are hiding an arsenal of tanks and planes inside an ancient Inca pyramid waiting for the order to take over the country. Señorita Rio steps in to stop them. 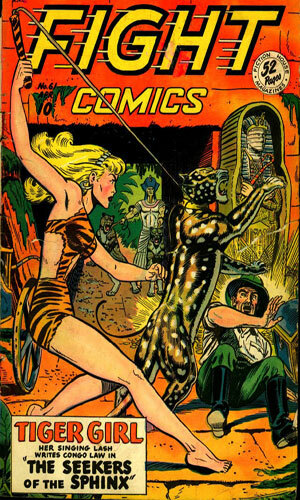 From Fight Comics #68 - Authorities suspect a traveling circus is behind a smuggling ring and they ask Señorita Rio to help prove it. She starts by looking into the murder of a high-wire performer. 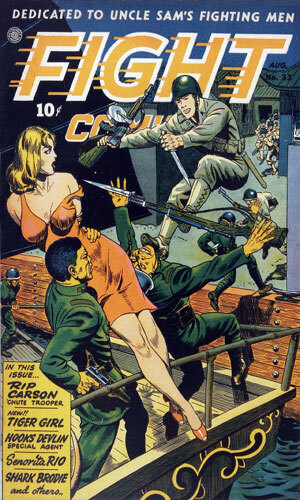 From Fight Comics #70 - The rumors of rebels receiving American aid in their desire to overthrow the government of San Carlos has caused Señorita Rio to be sent there to see for herself and report back. 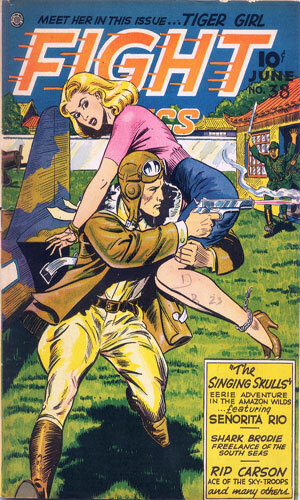 From Fight Comics #71 - Coming as a spokesman for the US as it sends a few jet fighters to a small South American nation, Señorita Rio is on hand when a flying saucer terrorizes the country. The artwork is really good at the beginning and IMHO just kept getting better. The stories were standard fare for the times but presented well and with enough interesting characters supporting the plot that they remained interesting. Moreoever, the attitudes and feelings of each of the years both during and after the War are great indicators of reality. Another highly impressive aspect to the Rio stories is the longevity of them. 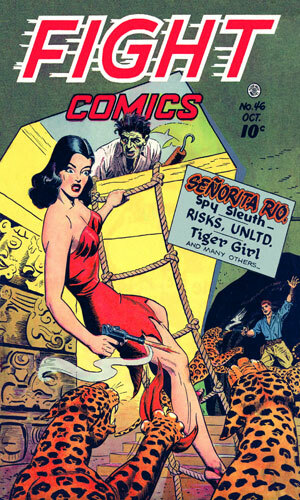 When compared to the many other spy comic series that came and went in the Golden Age, the ability for Señorita Rio to survive eight years in a male-dominated "world" and not need the constant saving by a man is truly remarkable. Rio took care of things herself and when danger popped up, she invariably thought of a way out instead of shrinking back in terror praying for a strong man to rescue her. If I was in trouble but knew Rio was on her way, I'd feel a lot better.